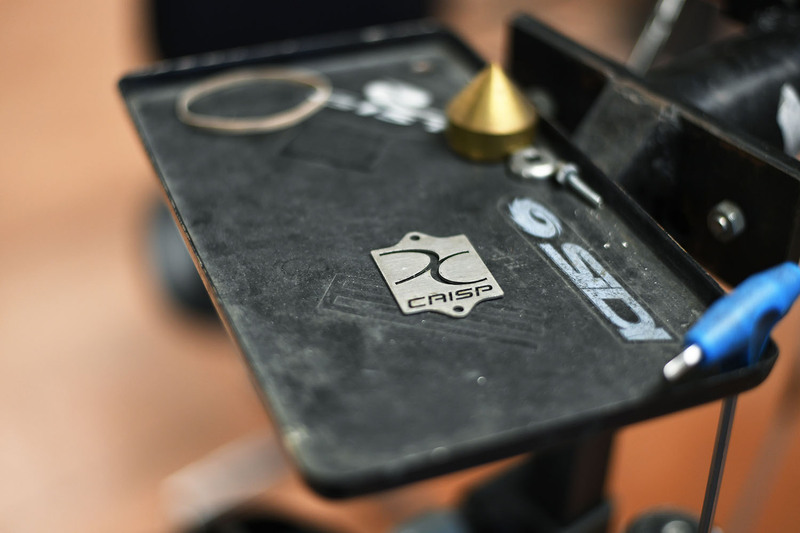 What was slightly unusual for me about visiting Crisp Titanium to photograph the process and try and understand the man behind it, was that usually I visit the cycling industry and often become friends as a result. With Darren, we were friends long before the call and opportunity came to photograph his workshop deep in the Tuscan hills I once knew so well but hadn’t re-visited for decades. What was more usual was that I was in Italy, became ill and both photographed a cycling master while barely able to stand up and hold a camera, and worse, hand delivered a bad cold to his family at their home. This has become a bit of a pattern if I’m honest, but that’s for another time. There was a break in between two jobs in Italy, where I found myself with a blank canvas, a car, a bag of cameras and a yearning to re-visit the blissful first memories of travelling across Europe in the back of a classic Citroen as the child of an architectural professor on search and record missions. Tuscany was where we’d stayed for the entire summers of 1984 and 1985, and town names like Montepulciano, Pienza and San Giminiano were etched into my timeline in the same way that my memories were made up of south west London street names. But I hadn’t yet returned. 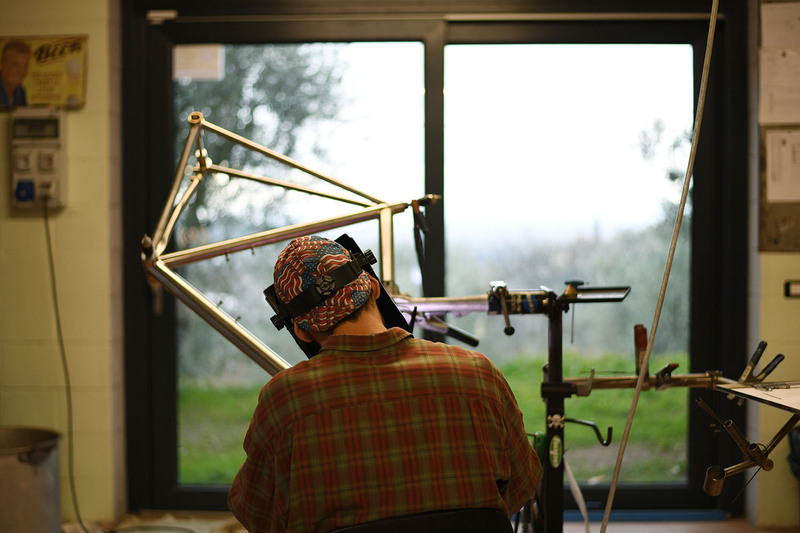 And now there was an American friend making bicycles out of titanium in the hills above my childhood haunts. So it seemed right to and I pulled out of Vicenza and headed west before the turn south back to my childhood. I found Darren’s idyllic home workshop high above the vista and villages of arguably one the most evocative landscapes in Europe. This was deep in the playground of generations of affluent British with good reason. With the beautiful villages left original, the dining and naturally the wine. The vistas with that unique light that so draws artists and photographers alike. And now titanium. And of course the natural warm, generous and sensitive welcome of an Italian greeting. Even to an ill visitor. Sorana made us beautiful pasta and set me up in an apartment along side the workshop while the girls were busy showing me their pet cat sat not awkwardly in a child’s push chair for it’s evening promenade. I don’t remember much of that evening other than having the longest deepest sleep for a while. I remember thinking the answer for long weeks on the road, living out of a bag and the nightly procedure of finding food and eating in a hotel room while downloading and backing up images was clearly a friendly home from from to break the cycle at least once a work trip. The following morning I was sat in the cozy workshop, spacious, modern and stylish and with the generous warmth and amiable aroma of a wood burner like a welcome friend in the middle of the room. 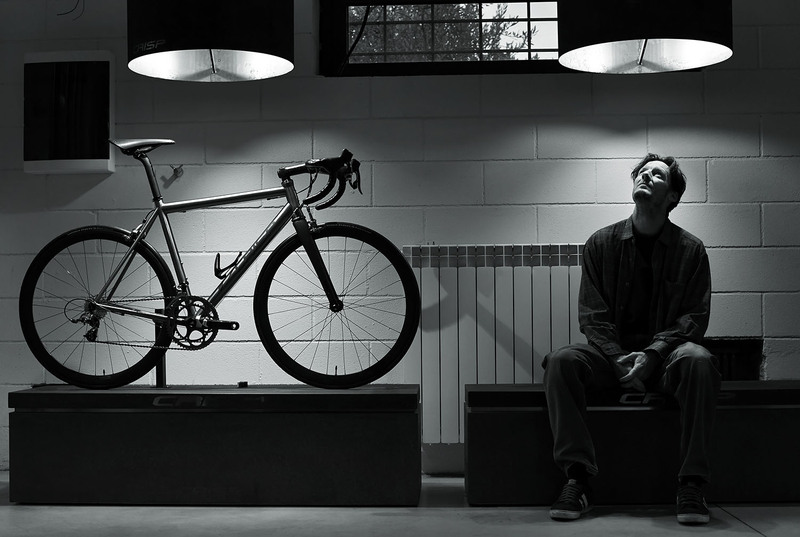 Darren sat opposite me in the foyer that doubles as a gallery of previous welded achievement, under incredible giant steel lamp shades that complement the feel of design paid attention to through renovation of these elegant buildings. To have a workshop is a goal for many. To have an elegant one, well that’s dreamy. As we sat and discussed whether our first meeting was at a Campagnolo birthday party years before or a Campagnolo wedding around the same time. We discussed the importance of lighting and he explained he made the lampshades above him. His architectural past crept out as he spoke like a vapour of a different colour but a similar depth to the cycling history I already knew As architecture filtered in and out of our morning’s conversations I realised the calling of Tuscany this time had been pivotal to me photographically. No matter how groggy it also felt. I remember it was at this point, sitting in his home that I decided I would rediscover my love of making portraits that had been overlooked and perhaps forgotten for a decade or more. 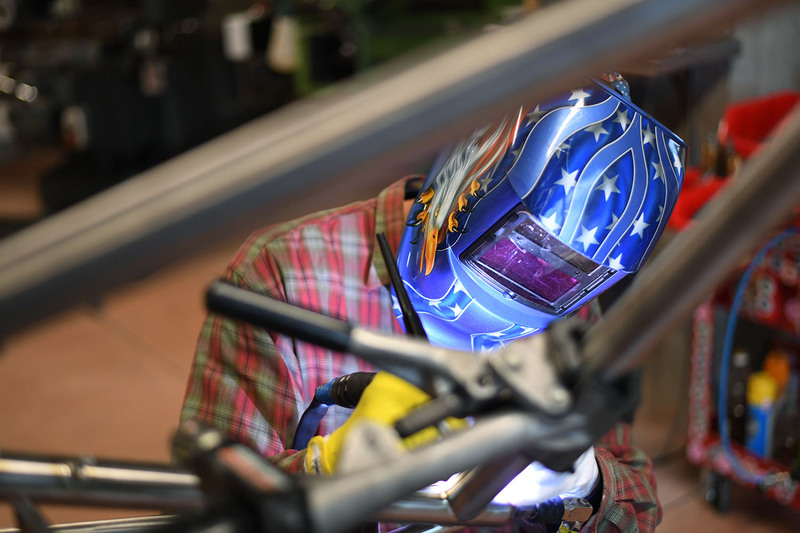 I would not take any more welding, filing, aligning photographs this factory visit, instead I would just make a portrait of this master of metal and subtlety, my friend Darren Mark Crisp that happens to make the most beautiful bicycles. Watching him work as I did that day from the relative arm’s distance of inside some long glass, the thing that was subtly apparent was his love of the bicycle. 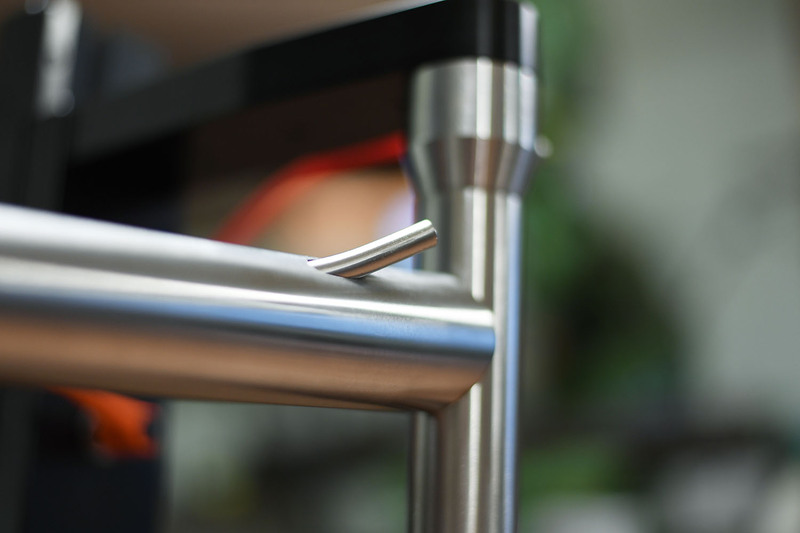 There was a calmness and contentment from his aura, a quiet confidence about his purpose here in this kitchen with these exclusive ingredients of refined metal. 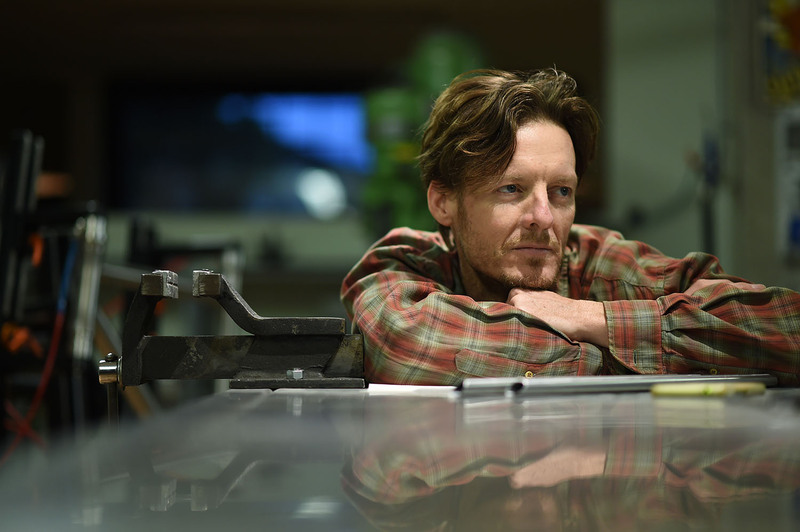 A quiet awareness of ability not unlike his silver screen lookalike Eric Stoltz often comes across like. 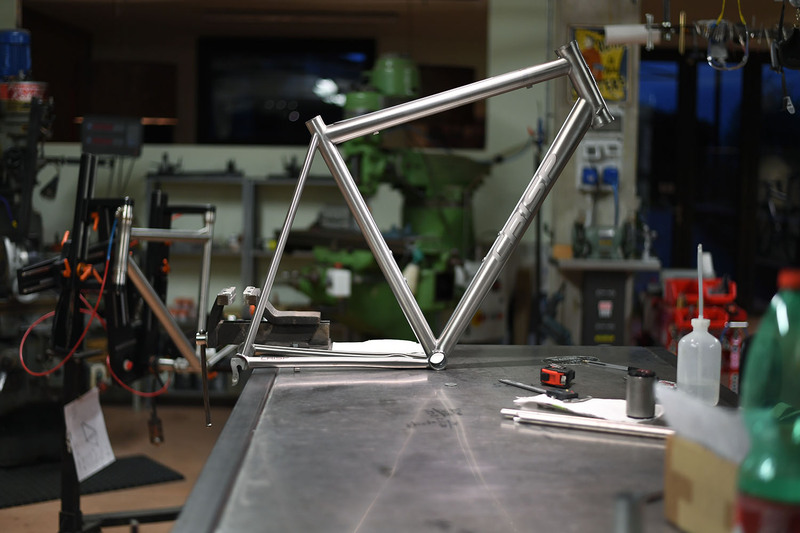 A very subtle, likeable and talented frame builder and friend alike. Talk drifted across cycling and other cultures. Our mutual friends within this two wheeled family popped up periodically for quotes. 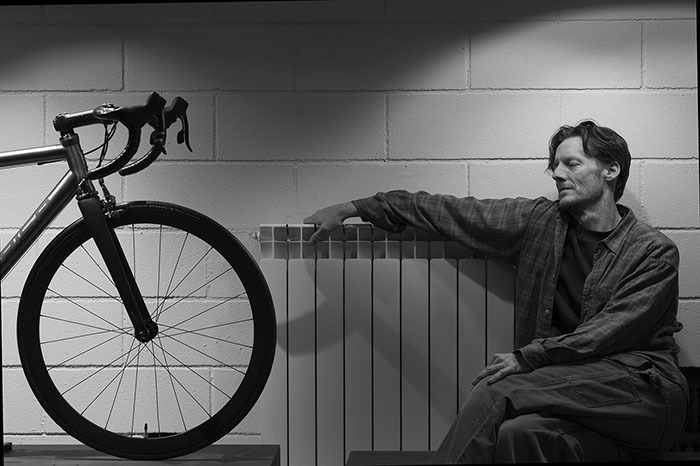 His long term friend legendary frame builder and former sitter for my portrait habit Dario Pegoretti opened up a knowing similar perspective we had on many viewpoints. Like the architectural connections we also seem to possess similar cycling aesthetes. My friendship with extended family Moots over in Colorado sparks up explanation of weld etiquette. I suppose I had always assumed welding was welding, I understood that my old Merlin MTB had double pass welds and had learned what that actually meant, but I suppose the thought that some might consider a weld might be like a signature on a tubed creation was interesting now. 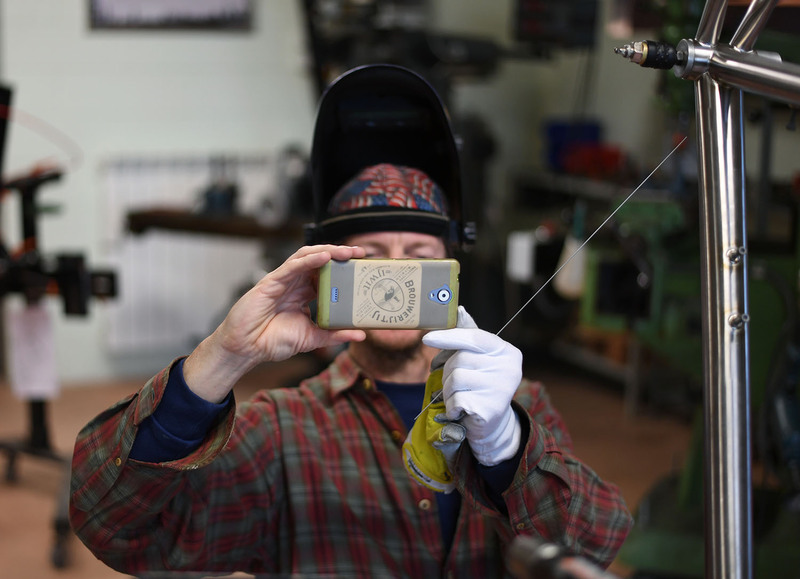 Darren said that he would hang out with Pegoretti in his workshop, welding a little and discussing his technique, welding machine programming and his weld sequence. I pretend in a small way that this is like my hanging out in a mentor’s darkroom printing with them and justbeing able to watch their personal handmade take on turning a tiny negative into an enormous positive. The differences between lenses, papers, chemicals, time allowed and taken away, type of dryer used, all the stuff that can affect the outcome after the main ingredient, the original exposure has been made. It was likely nothing like welding a titanium frame, but I took comfort in the connection the thought created. The fact that Darren explained he would sometimes study occasional parts or framesets from different marques including my extended Colorado family Moots, and study them like books, reading areas like weld stop/starts and sequences, temperature or penetration etc like turning pages on new but familiar chapters. Even though I had no idea on such details I found myself relating to the gist of it all in a photographic sense, or rather actually, just a sense of taking the right time to hand work something to make it as good as it can be made, titanium bicycle frame and fibre based paper photographic print alike. Occasionally i find myself in an engine room of the cycling industry that is so comfortable to me that despite the noise or the aggression of the machinery or the logistical photographic difficulties, i feel i could just stay and soak up the ambience created by the master of the operation. Pegoretti felt like this, as did Demon Frameworks. 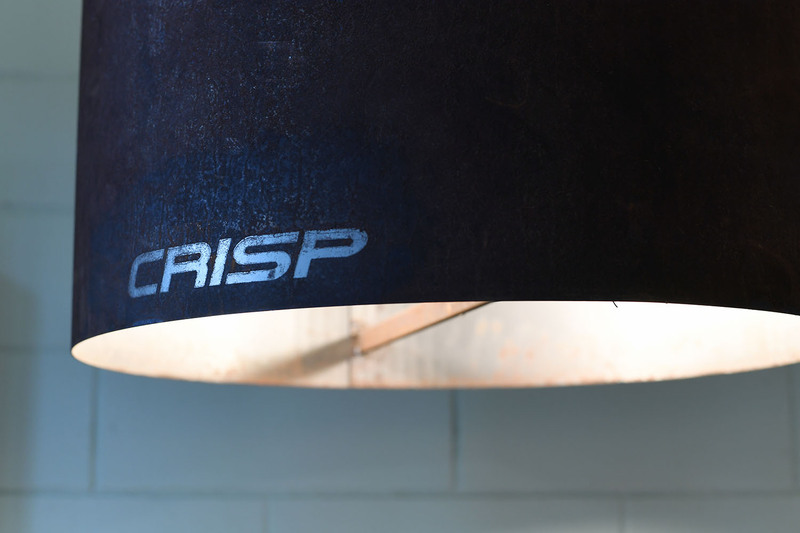 So does Crisp Titanium. My journey back north a couple of days later after I embarked on a childhood reunion tour was to take another turn as I drove into a flash blizzard in the accidentally downgraded non quattro rental car that was originally booked and would have meant a more secure journey over the Appenines than the weirdly empty motorway I embarked on. Like something from an armageddon movie I motored on alone for hours at a steady and slow pace until I arrived finally at the house of dear friends Andrew and Nicky of Rocket Espresso, pulling into a fresh powdered car park and sniffed my way into their family dinner where they looked after me and revived me with home made soup rather than the home made coffee I had imagined I’d actually yearn in a better state. But that’s another story for another time. I felt a little mischievous driving away from Crisp titanium with more photographs of Crisp than the titanium, but in some ways that Tuscan raid was a significant road trip for me. It was intended to trigger former memories of early life experience, and did in some ways having a walk around some of the famous hill towns mentioned above before an unlikely chance meeting with some former UK neighbours and friends that were now living nearby which led to a cup of tea and a portrait made at theirs, but what the feeling of rediscovery of a portrait fondness did evoke paled childhood nostalgia into perspective. This visit to a small but promenant vein in the heart of cycling created instead a new conversation in my ways of seeing. Something that continues to grow and interest, something that is as much a part of who I am as the scar on my knee from the bike crash I had ten miles from here all those years ago. Comments Off on Ride DMC.